Tree work is one of the most dangerous jobs you can have. There are lots of risks involved in tree pruning and removal. The Tree Care Industry Association, or TCIA, releases accident reports each month detailing industry and homeowner injuries. Last year, 60% of reported civilian tree work accidents were fatal. Of the industry accidents reported in 2014, only 8.7% were members of professional affiliations, like TCIA. Associations like TCIA and ISA (International Society of Arboriculture) provide resources and training on safety procedures to their members. Training- Oftentimes, tree work is not as simple as it seems. Tree felling, for example, is not as easy as cutting it and letting it fall. It requires establishing a drop zone, very precise cuts, and may need to be lowered in controlled manner with ropes. Tree felling is the most common way homeowners and amateur tree workers are injured in DIY tree care. “kick-back”, this occurs when a chainsaw is used improperly or when a the saw hits debris while cutting on the ground. 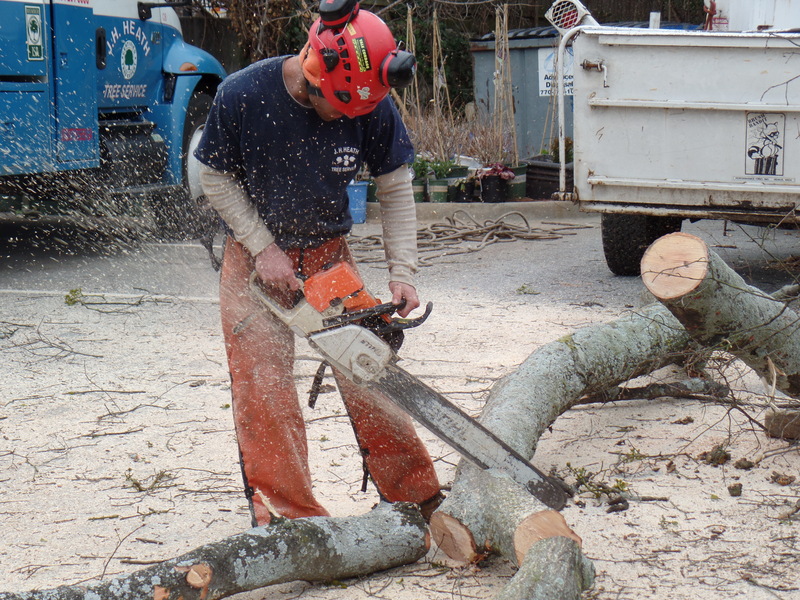 An OSHA requirement is the use of chain saw chap (protective pants) are worn while operating a chainsaw on the ground. A $75 investment could save your life! Experienced climbers- Ladders are typically used by DIY-ers to reach higher up branches. This is very dangerous, the person on the ladder needs two hands to operate a chainsaw properly and is then not properly secured on the ladder. Professional tree climbers are able to get up a tree using only a rope and are experienced in working in the air. Hazard awareness- Tree care workers are trained to asses risk when performing their work, including knowledge of power lines and drop zones. According to TCIA, each year many amateur tree workers are electrocuted directly from energized lines or indirectly through tools. Although we highly recommend hiring a professional, ISA Certified Arborist for all tree work, some small things can be taken care of by a homeowner. Since it is safety month, Heath Tree Service would like to share a few tips from our arborists on how to stay safe while performing tree work on your property. Assume all power lines are energized- Consider calling the electrical company to have the lines de-energized and downed until the tree work is completed. Never work within 10 feet of a power line, this type of work must be done by a trained line clearance expert with a second climber within voice range for aerial rescue if necessary. Weather- Never attempt to perform tree work in rainy or lightning, snowy, windy, or wet conditions. Eliminate hazards- Remove all people, lawn furniture, cars, etc from beneath the tree to minimize damage should a branch or the trunk fail. The right tools- Make sure you know how to properly use a chainsaw. Even experienced tree workers injure themselves, always use two hands to operate and wear chainsaw chaps while working. Never work with a dull saw, it can cause chainsaw kick-back. Climbing safely- Inspect branches for structural integrity before climbing. Never climb with tools in your hands. Use a spotter if you are using a ladder. Gear- Or PPE (Personal Protection Equipment) is a must-have when performing tree work. It is important to take measures to protect yourself from injury. Hard hats, safety glasses, chainsaw chaps, ear buds or muffs, and long pants and boots are industry standards. Never work alone- This is the most important safety tip. According to TCIA, in two-thirds of all homeowner accidents the person was working alone. Heath Tree Service is a proud member of both TCIA and ISA and conducts regular safety meetings with our tree care experts. If you have some tree work that you just can’t do on your own, give us a call and one of our professional, ISA Certified Arborists will take handle of all your tree care needs!